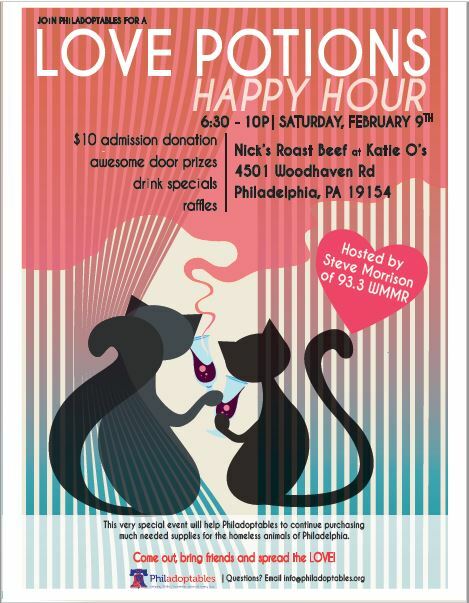 Philadoptables’ 8th annual LOVE POTIONS happy hour is Saturday, February 9th and guest-hosted by the hilarious STEVE MORRISON of 93.3 WMMR’s The Preston and Steve Show! Join us for a night of fun with friends and awesome raffles! A $10 donation gets you in & access to drink specials and all proceeds go to helping Philly’s homeless animals! Always a great event! Nick’s Roast Beef at Katie O’s is conveniently located less than 5 minutes from I-95 and less than 10 minutes from the PA Turnpike. Plenty of free parking!